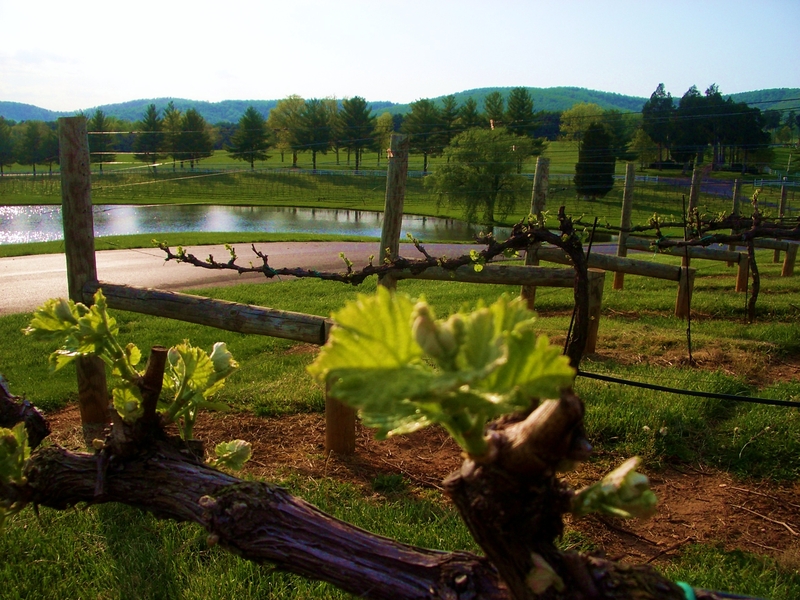 After the 2010 vintage in Virginia [arguably the best in recent times], the 2011 growing season was going to struggle to reach the lofty standards of its predecessor. To say that 2011 failed miserably would be similar to saying that Drew Brees had an okay year [this makes sense if you know that he broke Dan Marino’s all time passing yards in a single season, 5084 set in 1984 when Marino played for the Miami Dolphins]. Mother Nature ruled this year and her awesome power was on display more times than any of us would wish for. From a devastating earthquake in New Zealand to the horrific Tsunami in Japan, 2011 was littered with catastrophic natural disasters. Closer to home, Tuscaloosa was hit hard by the April 27th Tornado and Virginia experienced a 5.8 magnitude earthquake on August 23rd, quickly followed by the August 27th appearance of hurricane Irene. 2011 was certainly unforgettable, but for all the wrong reasons. The season started off well enough with a milder than normal winter, allowing us to get the vineyard pruned with time to spare. We started seeing some bud break around April 7th, which is fairly typical in the Chardonnay. We experienced no loss due to spring frost, which can be especially damaging to our 16 acres of Viognier, and all signs pointed to a decent growing year- at least we were off to a pretty good start. Flowering started 56 days after bud break and generally commences when daily average temperatures are between 58 and 68 degrees. Fruit set occurred almost immediately after [when the fertilized flower produces a seed and a berry to protect the seed]. This stage is one of the most critical periods for the grape grower as it has ramifications for the potential yield of a vineyard since not every flower on the vine gets fertilized. Weather conditions play a significant role and stress conditions including lack of water, temperature and humidity can all play a role in significantly reducing the flowering and thus the crop. Up until this point, we were very optimistic about the potential harvest. We had a full crop throughout the vineyard and everything looked pretty good. Our vines were balanced, disease pressure was minimal and other than canopy management, weed control and trunk stripping, the season was pretty much going along as expected. It was around veraison or the days before that we really started experiencing some rain. 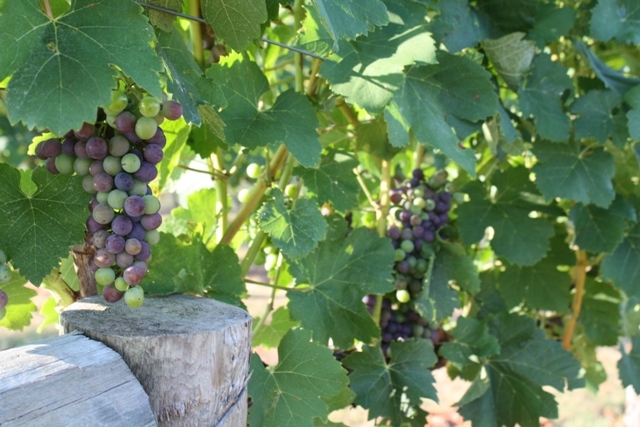 Veraison is the point in which green grapes turn red, due to Chlorophyll turning into Anthocyannins [red varieties] and Carotenoids [white varieties]. It is also the point in which sugars in the form of glucose and fructose are produced and the acid levels drop. 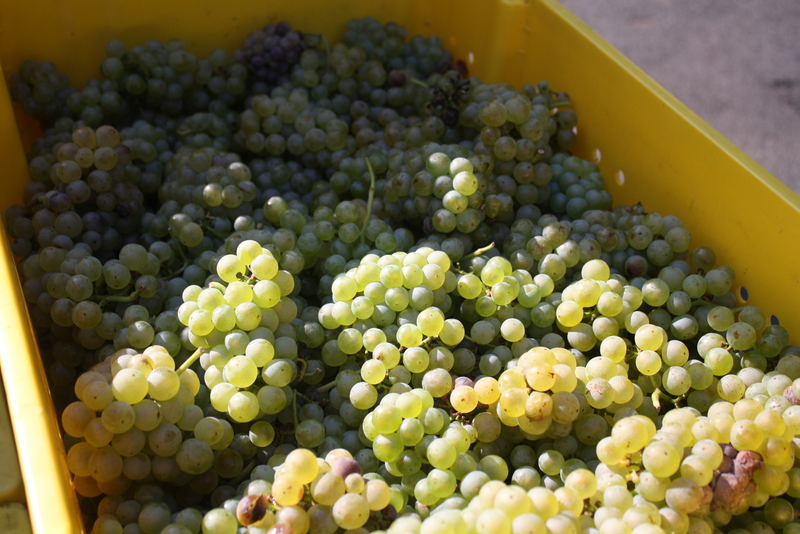 The problem with rain, and as was the case in 2011 continuous rain, is the development of mildews and especially botrytis. While botrytis [noble rot] can make some of the most sought after wines in the world, with continued wet conditions this rot can turn into a malevolent form [grey rot or vinegar rot]. This year I really got to know Ol Betsy [the faithful tractor] and Herb [the sprayer], because other than leaf pull, dropping infected fruit and praying, the only thing we could do was spray. This goes against all matter of principle in our grape growing and winemaking philosophy, whereby intervention is ideally kept to a minimum. Unfortunately this year was one in which ideology was shelved and we did everything we could to ensure we produced decent fruit and ultimately decent wines. So how did we fare in the winery? Thankfully Chardonnay, Verdejo and some Viognier were picked prior to the major rains, albeit at lower than desired sugar levels. The promising aspect of these wines though is their incredible acidity, a component of winemaking I think needs more attention. Acidity ensures the wines are focused and bright and we worked really hard to reflect that in the wines we were producing. 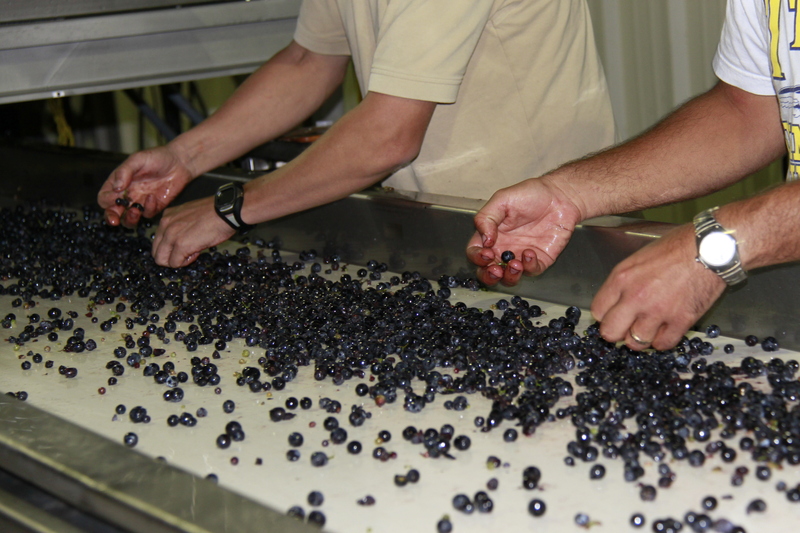 Pressing was done as gently as possible and the wines were made as anaerobically [devoid of any oxygen] as possible. Very few wines were barrel fermented, choosing instead to ferment in temperature controlled stainless steel tanks. Having tasted these wines last week, I can honestly say that the Chardonnay is the best we have ever produced, and while the Viognier is not as bright in character as in recent years, it is still outstanding. They crackle with vibrant acidity and have a varietal character, which is fantastic. Reds were hardest hit, with later season reds such as Cabernet Franc and Petite Verdot feeling the force of the rain. It was a catch 22 situation for us as the fruit was not ready to be picked, sugars were low and tannins were green and under-developed- but in hindsight, if we had known that we would experience that amount of rain, we truthfully would probably have taken it all. At the end of the day, the Merlot, Touriga and Norton wines are fantastic. We managed to pick ripe Merlot and Touriga, and well Norton, that is a tough son of a gun and I was so impressed with how it fared, I even applauded it in a previous blog. What of the other varieties? We made an incredible Rose’ this year, a dry style that we have already bottled and are looking at releasing in the next few months. When the vineyard gives you lemons, you make lemonade, but it is great lemonade. All in all though, I think we manged to dodge a bullet, in that it could have been far worse than what it was. I am thankful for having some experience in Virginia and after working the 2003 harvest, I was way more prepared this time round. I can only shudder and imagine what would have happened had this been my first vintage in Virginia. Overall I give the vintage a B+, the wines are developing character and should be fantastic. Although lighter in style than 2010, these are vibrant wines and will no doubt bring pleasure to many a wine drinker. So while 2011 wraps up, we are already in the vineyard pruning for the upcoming growing season. After a challenging season, I am more focused and motivated than ever to ensure that 2012 goes down as one of our best season yet. So what was the best thing I made all year? That easily is my daughter Aria. A blend of 50% Kathy and 50% me, matured in amniotic fluid for 9 months. Released to the world on December 5th, she is showing signs of shock and will need some time to mature. She is already gorgeous but will continue to improve over the next 80 years and will provide joy to many. So I guess 2011 was really the best year ever if I really think about it.